Bodrum, known in ancient times as Halicarnassus. Opposite the Greek island of Kos, on a stupendous peninsula in the Southern Aegean rises the city of Bodrum, Halicarnassus in ancient times, the Carian capital and native city of the historian Herodotus. Bodrum is similar in air and color to parts of Southern Italy with oddly-shaped whitewashed houses filled with flowers, mostly purple and fuchsia-colored bougainvilleas, oleanders and prickly pears. The city has plenty of shops selling almost everything and there are numerous restaurants, hotels, nightclubs and cafes along the shore. Street vendors ply marine sponges, oranges and mandarins. Bodrum has been called the St. Tropez of Turkey, for its translucent sea, numerous bays and small ports. The city has barely 25.000 inhabitants who during the winter live off fishing, sponge collecting, boat building and agriculture. The famous wooden boats called caiques are made here. Bodrum is a paradise for water sports with diving, wind-surfing, water-skiing, sailing, jet-skiing, paragliding, beach sports, swimming and thrilling slides in aqua parks. The surrounding hills are excellent for walks, strenuous for exercise or slower for pleasure. Horse-riding and tennis are also available. 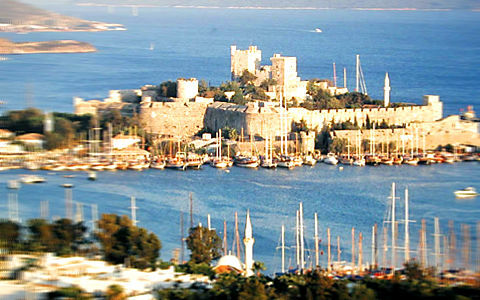 Bodrum is also the site of King Mausolus’s Tomb, one of the Seven Wonders of the Ancient World. The city is a charming holiday destination with a wide variety of hotels, warding house and rental houses.